The presidential rollout parade continues! 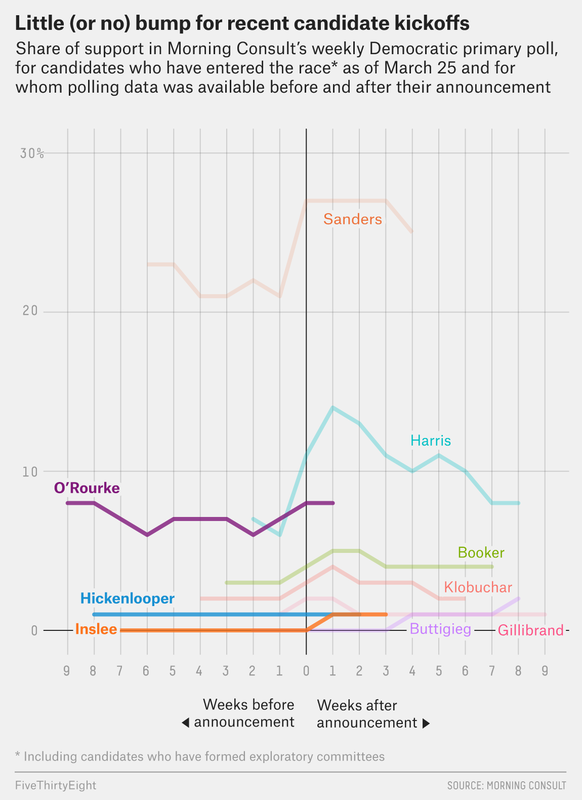 Since I last wrote about candidates’ polling bumps after they declared their presidential campaigns, Beto O’Rourke has joined the 2020 Democratic primary field, and we’ve gotten full data for a couple of other candidates. But it turns out that none of their entries into the race really caused a bump in their poll numbers, according to one set of polls. O’Rourke had an … interesting campaign launch that has generated some mixed signals. On the bright side for him, he raised more than $6 million in the first 24 hours after announcing his candidacy — a sum that topped all other contenders, even small-donor darling Bernie Sanders. But O’Rourke’s bump in the Morning Consult poll was decidedly meh: He went from 7 percent in the poll the week before his March 14 announcement to 8 percent in the poll the week after. Other polls, however, showed larger gains for O’Rourke. He rose by 2 percentage points in CNN’s polling and by 7 points in Emerson College’s polling (although CNN’s pre-announcement poll was taken in December and Emerson’s in February, so there was plenty of time for other events to affect his standing as well). Overall, it appears as though O’Rourke has gotten a smaller bump than Sanders and Kamala Harris, but larger than that of other candidates. However, a pair of The Economist/YouGov polls — one each taken before and after his kickoff — had disappointing news: O’Rourke’s net favorability rating (favorable rating minus unfavorable rating) among Democrats fell from +45 points before his announcement to +40 after it, although the changes were within the margin of error. That could reflect the fact that even though O’Rourke got lots of cable-news coverage in the days after his launch, some of it was unflattering. Inslee and Hickenlooper also underwhelmed. Inslee, the governor of Washington, had been polling at 0 percent before his March 1 announcement, and he inched up to 1 percent the week after he declared. But Hickenlooper, a former governor of Colorado, saw no change — he polled at 1 percent both before and after his March 4 campaign kickoff. One silver lining for Hickenlooper is that Morning Consult found an uptick in the number of people who could form an opinion of him: The week before his announcement, 20 percent of respondents had either a positive or negative opinion of Hickenlooper; the week after, 26 percent did. And some bad news for all three candidates: As you can see from the chart, candidates’ polling bumps tend to dissipate after their kickoffs, so they’ll need to garner attention some other way to prove that they have staying power in the race. The Democratic primary field is taking shape. In this episode of the FiveThirtyEight Politics podcast, the crew debates which candidates have done the best job of introducing themselves to voters in the early days of the contest. The team also takes stock of Republican defections from President Trump — on the recent national emergency declaration vote and other issues. On Saturday, Democrat Julian Castro held an event in his hometown — San Antonio, Texas, where he served as mayor for five years — to announce he is running for president. But Castro’s campaign might be a bit a of a long shot considering he’s polling between 0 and 2 percent in state and national polls. That said, he has all the makings of an inspirational candidate — he’s young and ambitious, he overcame a childhood of poverty to attend Stanford and Harvard Law, and if he wins the nomination, would be the first Latino presidential nominee on a major-party ticket. But he also disappeared from the national spotlight after 2016 and now faces an uphill battle to convince voters that he is the strongest choice to oppose President Trump in what could be a very crowded 2020 primary field. Just 44 years old, Castro first held public office at the age of 26 when he won a seat on the city council in San Antonio. He then went on to run for mayor in 2005, but narrowly lost that race before handily winning in 2009. He was re-elected as mayor twice and made his first big national splash when he was selected as the keynote speaker of the 2012 Democratic National Convention. Castro was the first Latino to fill that vaunted speaking slot, and was labeled a “rising star” as a result. In 2014, then-President Barack Obama chose him to be Secretary of Housing and Urban Development, and in 2016, Hillary Clinton seriously considered Castro for her vice presidential pick, but she ultimately opted for Virginia Sen. Tim Kaine instead. Following his tenure at HUD, Castro founded the political action committee Opportunity First to plan his next steps and promote candidates in the 2018 cycle. Leadership PACs such as Castro’s are often used as fundraising vehicles to build a foundation for a future campaign as well as a way to donate to other politicians’ campaigns. Opportunity First probably did more of the former than the latter — it only donated 10 percent of the money it raised to candidates and parties at the federal, state and local level. Castro also published a memoir in 2018 about his upbringing in a poverty-stricken neighborhood in San Antonio with his twin brother, Rep. Joaquin Castro, and their Chicano activist single mother and Mexican-born grandmother. Julian Castro has a story to tell voters. But it remains to be seen if he can sufficiently raise his profile to that of a real contender. FiveThirtyEight editor-in-chief Nate Silver recently broke down the five main constituencies of the Democratic electorate, and it seems that Castro’s path to victory likely involves gaining support from some mix of Hispanics voters, Millennials and Party Loyalists. Much of Castro’s political career has been built on support from Latino voters. 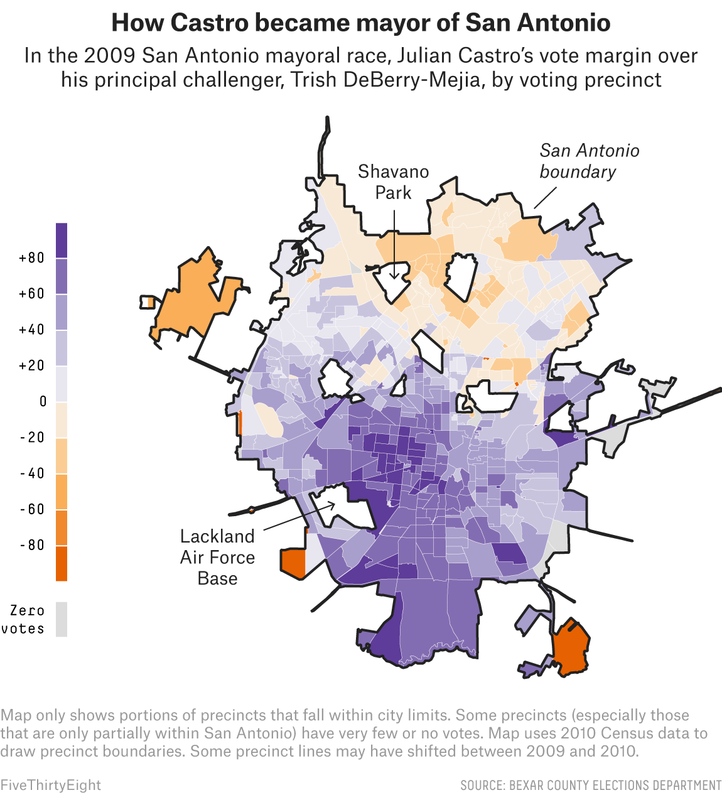 San Antonio’s population is more than 60 percent Latino, and in his successful 2009 mayoral race, Castro won the nonpartisan election by 27 points over his closest challenger,1 principally by running up the margins in San Antonio’s heavily Latino neighborhoods, particularly in the southern half of the city. In a cluster of precincts northeast of Lackland Air Force Base, for example, as much as 90 percent of the voting age population was Hispanic at the time of the election, and Castro won many of those precincts by more than 80 points. Conversely, in some majority-white precincts north and east of Shavano Park, a small independent city surrounded on all sides by San Antonio, Castro’s chief opponent won by more than 20 points. Castro has also been vocal in his support for a renewed push by Democrats to reach out to Latino voters. Turnout among Latinos is traditionally low, but given how Obama energized turnout among African-American voters in his presidential bids, Castro’s candidacy could similarly boost Latino participation. But winning the Latino vote probably won’t be enough. 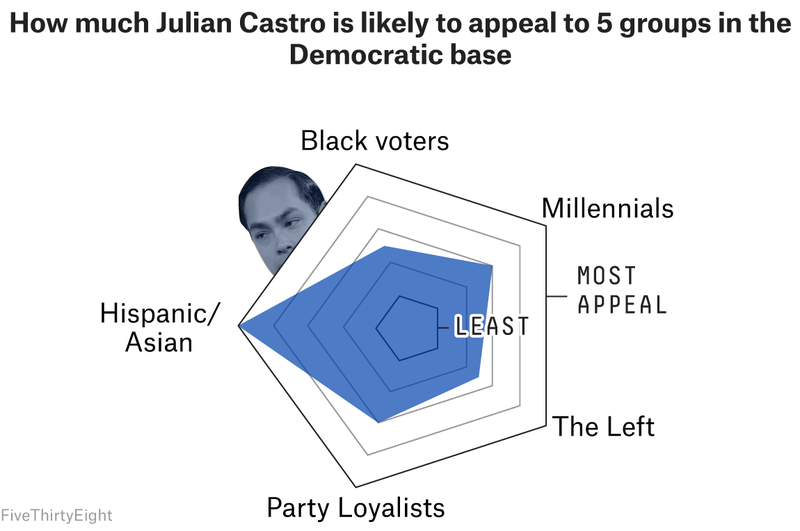 Castro will also need to make inroads among millennial voters. An NBC/Generation Forward poll released in October 2018 found that the personal quality millennials were most likely to say they wanted to see when deciding who to vote for was a candidate could bring about change. And, arguably, what could be more of a change from Trump and his anti-immigrant rhetoric than a Latino candidate of Mexican descent? As a young Latino man from a San Antonio — a fast-growing, youthful and diverse city — Castro could try to make the case that his experience leading the nation’s seventh-largest city could be the right step for America’s future. And as a former member of the Obama administration, Castro could also play up his White House connection with Party Loyalists, who tend to be an establishment-friendly group. The former president remains incredibly popular among Democrats, and Castro can use his time in Obama’s Cabinet to claim some of that legacy in his own campaign. Among potential Democratic presidential candidates, former Vice President Joe Biden might be the only one with a more obvious connection to Obama than Castro. The Democratic Party is increasingly diverse and its voters show decreasing levels of racial resentment — a measure of racial attitudes, especially how whites feel toward nonwhites — particularly among younger Democrats. Yet, this doesn’t necessarily mean voters are ready to elect a Latino candidate. 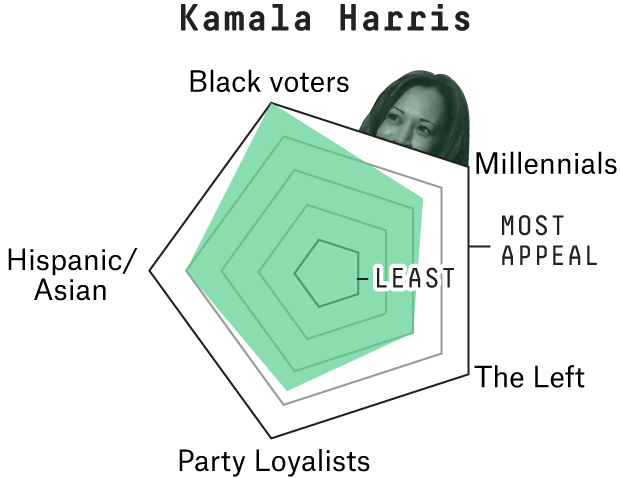 For example, 2016 primary voting patterns show that Clinton was seen as the “Obama candidate,” meaning Clinton’s support among Democrats with racially conservative views fell sharply compared to how she performed in 2008, when she was running against Obama and won many of those voters. What’s more, there’s a supposed “electability” argument that Democrats need a white (and probably male) nominee in order to defeat Trump in the general, so we shouldn’t underrate how race and ethnicity could affect the primaries. Castro’s level of political experience is also a double-sided coin. On the one hand, he is a relatively fresh face and Democrats may want someone new and young to face Trump. However, Castro might have too little experience. Although he served as San Antonio’s mayor for five years and Obama’s HUD secretary for two and a half years, he’s never run for statewide office in Texas and it’s unclear where he stands on a lot of major issues. His relative lack of experience probably played a role in Clinton’s choice to not pick him as her running mate in 2016, and it could be an issue for him as a presidential candidate, too. Castro will also need to gather the resources to mount a serious campaign. With his Texas connections, Castro could have access to lots of campaign cash. But it’s possible that another noted Texan, Beto O’Rourke, could pull away many Texas donors who could help jumpstart Castro’s campaign. O’Rourke’s 2018 Senate campaign captured national attention that could translate into a presidential campaign. O’Rourke raised nearly $80 million for his Senate race, and among contributions large enough that their origins are reported by Federal Election Commission, a bit over half of his total cash came from the Lone Star State.2 An O’Rourke bid would also put two young Texans in the field, so Castro and O’Rourke could find themselves stepping on each other’s toes and making appeals to similar parts of the electorate. If he gains traction, Castro might also take hits from The Left. When he was in contention for Clinton’s 2016 vice presidential nod, progressive groups attacked Castro for being too friendly toward Wall Street firms when dealing with delinquent mortgages and for not fighting hard enough for minority communities. Castro also improved his political fortunes in San Antonio by building a better relationship with the city’s business community, which had been skeptical of him in his first mayoral bid in 2005. Such coziness would not win him support from The Left. It will be a while before we know if Castro is a true contender. But what we do know now is that he’s running and that his candidacy could make history. Politics Podcast: Can Democrats Win Big With Only Women? In this week’s episode, the FiveThirtyEight Politics podcast crew considers whether Democrats can win the House or Senate by relying solely on their advantages with women. The team also looks at early indicators of who might run for president in 2020, such as who has visited Iowa, written a book or campaigned for fellow party members.